As the month of May draws near to its end, the prospect of the great feast-days of June is on the horizon. 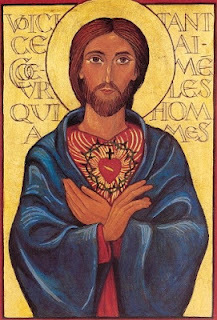 Among them is the great Feast of the Sacred Heart of Jesus that I will anticipate here. It is a devotion Jesuits have always promoted, and continues to be promoted through the work of the Messenger of the Sacred Heart magazine and the Hearts on Fire retreats. Pope Benedict has invited the faithful to renew their devotion to the Sacred Heart and with good reason: as a symbol – and object of meditation – it contains many dimensions of the mystery of God. Let’s reflect on a few of those. First, the heart is visible. Jesus does not conceal his love, but makes it readily available to all. It is offered to us. He is vulnerable in that respect. It calls us to let down our barriers. There are thorns that encircle it. This is not a valentine, but a passionate love that has and will suffer for the beloved. Just as our own vulnerable love can sometimes suffer, so does Christ’s for us. There’s a cross on top of the heart. John and Mary stood at the foot of the cross when others had run away. This is an invitation to us to stand with them for Jesus. However this plays out in our lives, this is love in action. The wound. It reminds us of the blood and water that flowed when the heart was pierced by the soldier’s lance. Both elements signify the life (Eucharist and baptism) that results from his sacrifice. It is also the birth of the Church. The fire blazing. The most dramatic element, it tells us about the fierce love that God has for his people. It offers light and warmth to all who approach, and its blaze melts the hardened parts of our hearts. This fire is also contagious, and will inflame us in going out to set the world on fire. A wonderful new book was just released on rediscovering the Sacred Heart called A Heart on Fire, written by Fr. James Kubicki, S.J., director of the U.S. Apostleship of Prayer. It’s a fresh approach to this perennial devotion, and is highly recommended to all – both the experienced and the new. May you feel a certain familiarity with the Heart of Jesus, the “Heart of the World,” when June 15 rolls around this year! And please pray for a few of the young Jesuits in Canada who will be leading the Hearts on Fire young adult retreats this summer. Fr. Kubciki's book "A Heart on Fire" is available through many online sellers. Toronto area readers will also find it at Joseph's Inspirational Bookstore. Am praying for you all and your mission here in Lourdes! Loved the remark, "this is not a valentine"! Lol.